I have a weakness for all things cat-related, so it's no shock that they get my attention when I find minis featuring my favorite feline forms. Here's two that I thought you should know about. 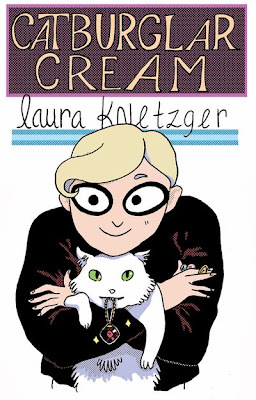 A thief with a sweet tooth has a part-purr in crime, going after a diamond in a relic museum with a secret even its curators are unaware of in a silly story that keeps one step ahead of the reader's realizations of just how ridiculous it is. Jeremy Cream, owner of Toffee, a cat with an eye for larceny, investigates and then steals the rare diamond in an implausible scheme that's so endearing--seeing a cat burglar worth with a cat as his accomplice--that you don't worry about it to much. With some fun visuals--including Toffee's journey through the air vents, this one is playful from start to finish. Knetzger knows that the whole idea is unrealistic and doesn't try to make it otherwise. Instead, she pushes the plot even further over the top when we learn just why Cream does this in the first place. (If you want to know, you'll have to buy the comic, because I'm not spoiling it for you.) It's a great way to look at things, taking a silly idea and making it even more so by the finish. Knetzger's art is very fluid, with some great perspective shots, like when Cream and Toffee flee from a guard they've hit with sneezing powder and appear to be headed straight for the reader. She uses action lines quite well, and has a good consistency of character design. Cream and his kitty look the same on the first page as they do on the last. Overall, there's not a lot of detail work--this isn't an intricate comic where you pour over the panels looking at technique--but what we see gets the job done and gives us a sense of place. I really enjoyed this one, and definitely recommend it to cats and caper fans. You can pick up a copy here. A series of short adventures between a fairy and a cat, including exploration, music-making, and a hint of jealousy, all drawn in a hyper-detailed OEL style that drips cute off every page. If you enjoy the blend of thin lines, huge eyes, and slightly undernourished characters, this is really gorgeous. 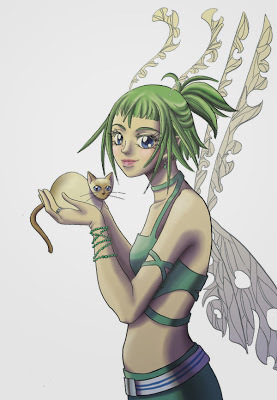 Carson's characters are seriously endearing, as the tiny fairy works with her pal, the only Siamese cat I've ever encountered who doesn't talk. The use of scale is part of what makes this so much fun. Neither are that big, so even climbing a fence requires assistance. When the fairy loves a Shojo boy, we see what she can't--namely the difference in stature. That's fine, because the indignant cat takes care of things for her! All of these stories are short sets, showing off Carson's incredible talent. She has a great handle on what she wants to accomplish, and her creative influences, which are mentioned on her webcomic's site, definitely show in the art's pacing an execution. Like Knetzger, her backgrounds are sparse, but the detailing on the fairy (right down to the zipper on one of her outfits) is intricate. The fairy emotes broadly, with the large eyes and triangle chin leading most every panel. This lets us see her go from lovesick to jilted in only a few illustrations or know how the cat is feeling. It's very well done, but I can't tell you where to get it, because I had a hard enough time finding this cover image, let alone more. A shame, because I'd like to see Carson get more attention--she's got a good style already that deserves more attention. I can't even link to her webcomic, because it appears stalled, which is a shame. Here's her DeviantArt page, though, so you can get a good feel for this creator who's worth checking out--if you can figure out how!